What is the true cost to taxpayers of loan guarantees? 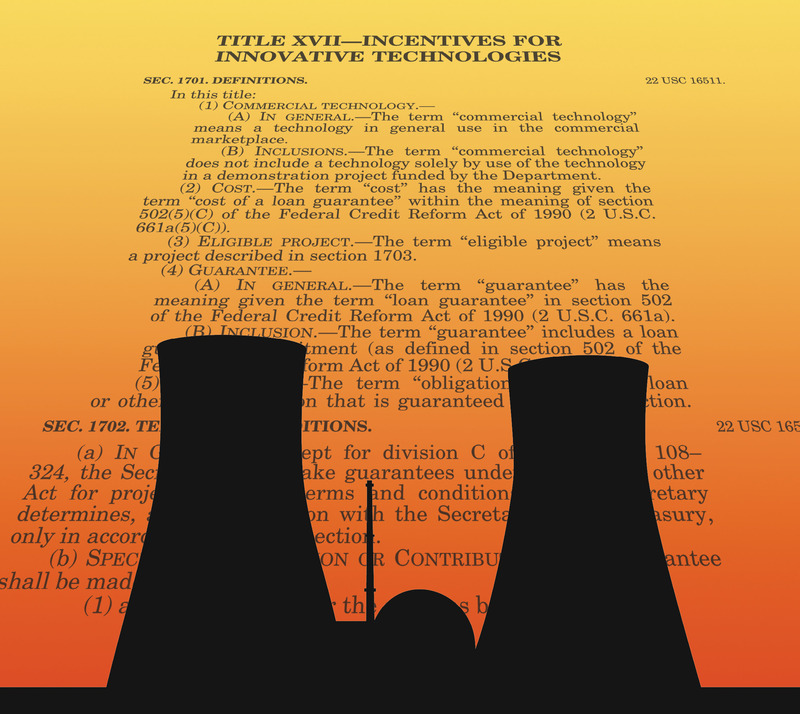 Obviously, we learn the cost of a particular loan guarantee, like the one for the bankrupt Solyndra, ex post—it’s the amount of money the government has to payout to the creditors. But what is the right estimated cost ex ante? 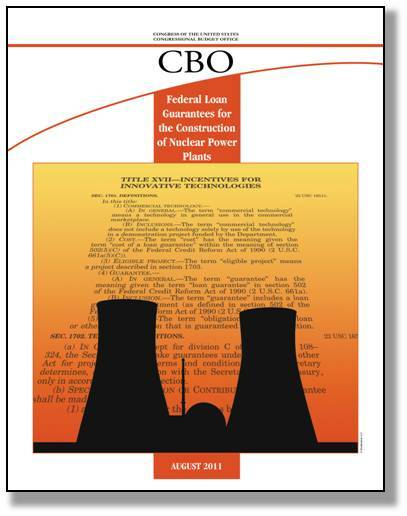 Coincidentally, August was also the month that saw the CBO publish a report on the true cost to taxpayers of Federal Loan Guarantees for the Construction of Nuclear Power Plants. Responding to the new regulatory reforms such as the Dodd-Frank Act in the US, banks are now marketing “collateral transformation” services. A good source for various materials on this issue is Tracey Alloway’s coverage in FT Alphaville. What are these services? How are they connected to the reforms? Should we be worried? Collateral transformation is a fancy name for a particular type of loan, as shown in the top three boxes of the figure below. A company/fund trading a standardized derivatives contract cleared by a central counterparty (CCP) must post a margin. Initial margins are posted with cash and government securities; variation margins are posted with cash. Holding cash for the purpose of posting margins exacts an opportunity cost, for it earns less than if invested in less liquid securities. 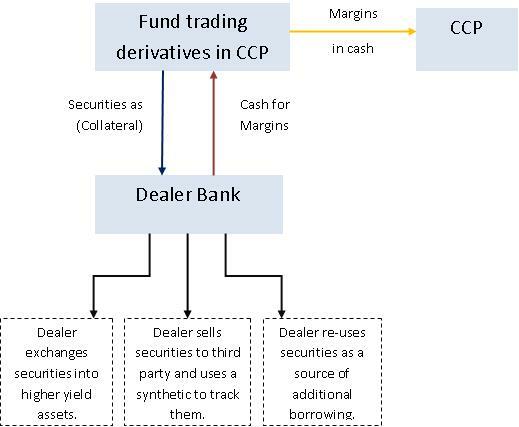 The bank steps in and offers to lend the company/fund the cash for collateral at the CCP, and the company/fund provides less liquid securities it holds in the balance sheet to the bank as collateral. In addition to providing the company/fund with liquidity, the bank structures the arrangement to easily mesh with the mechanics of trading, settlement and so on, so as to minimize the administrative costs to the institutions that are its customers. See this brochure and this article. One factor that might go unnoticed, however, is the surprisingly strong role of decision biases in the investment decision-making process—a role that revealed itself in a recent McKinsey Global Survey. Most executives, the survey found, believe that their companies are too stingy, especially for investments expensed immediately through the income statement and not capitalized over the longer term. Indeed, about two-thirds of the respondents said that their companies underinvest in product development, and more than half that they underinvest in sales and marketing and in financing start-ups for new products or new markets. Bypassed opportunities aren’t just a missed opportunity for individual companies: the investment dearth hurts whole economies and job creation efforts as well. The article provides a useful examination of biases in decision making. Many managers would concur that a million dollars lost on a bad investment in the recent past would tighten the finances of a company much more than a million dollars won would relax the constraint. This may be especially so in a period when creditors are deleveraging and equity holders are quite wary about bad news. The McKinsey piece reminds us that a project is not just the Power Point slides and the numbers in a spreadsheet, but what these are in the eye of the beholder. But how does that relate to the global picture of corporate cash hoards? It’s one thing to be humble about the quality of decision making and the biases that affect it. It’s an entirely other thing to connect those biases to the very large aggregate economic fluctuations in the global economy, including the cash that companies seem to think it is prudent to husband very carefully right now. When did prudence became a bias? Reforming the financial system involves not only the grand public battles over legislation and rulemaking, but also the substantial trenchwork that falls to staffers in the many agencies responsible for carrying out the mandates. And it is heartening to observe this work advance. One of the many interesting analyses being produced en route is a study by Daniel Heller and Nicholas Vause at the Bank for International Settlements (BIS), the international organization of central banks. The purpose of the report is to produce an estimate of the financial resources that Central Counterparties (CCPs) would need to safely clear interest rate and credit default swaps. Central clearing of derivative trades is one of the major mandates of the Dodd-Frank Financial Reform Act in the U.S. and of comparable reforms in Europe. In a number of our previous posts, we have emphasized that end-users have much to gain from the central clearing mandate—see here, here, here and here. 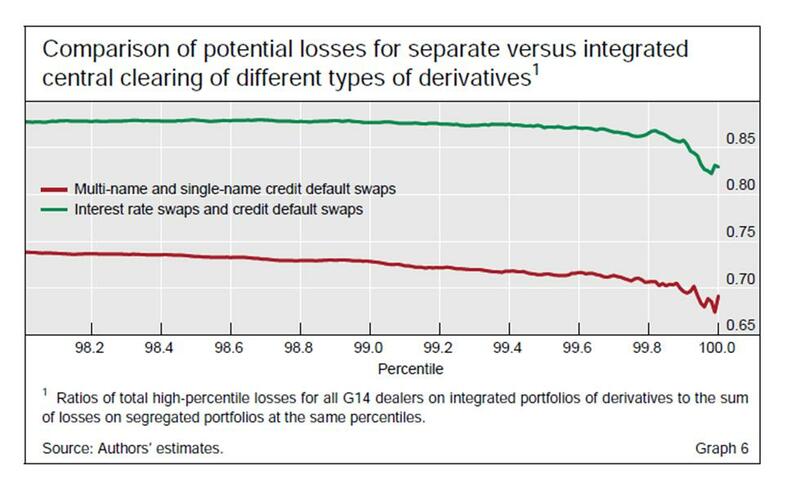 Central clearing creates the possibility to reduce the total amount of credit risk in the system, lowering the overall costs to the various parties using derivatives, including non-financial companies seeking to hedge their commercial risk. One reflection of how risks can be minimized, depending upon how the mandates are implemented, shows up in Graph 6 of this BIS study, reproduced below. We began this series of posts recapping the finding that a currency carry trade investment has historically produced high return relative to the low risk. This finding is not consistent with models in finance that focus on the correlation between an investment’s return and the return on some benchmark stock portfolio. Using these models, and looking at the historical distribution of returns, the carry trade looks like a good bet, even accounting for bad outcomes. Posts #2 and #3 in the series reported on one route of the research effort to explain the puzzle, which attributes the abnormal return to the “peso problem”. But other researchers have been pursuing different routes. To wrap up this series, we’ll quickly mention some of this work.